After the voting of the Greek HoD you may ask why the votes were 14 in total, when the organisations appointed to the committee are just 12. That’s only the latest of the magical wonders around OpenXML. However, during the discussion, the representative of the Information Society showed the fax he had received, to which was attached the decision 19103/08 of the ELOT administration, dated 1 February 2008, which modifies the composition of the Committee by adding four new organisations: the Ministry of Education, two departments of the Ministry of Economics, and Information Society S.A. The representatives of NTUA had not been informed of this decision. Who would join at the last minute for no given or apparent reason? Why? Why at this late stage? We have spotted quite a lot of what seems like Microsoft manipulation in Greece recently, e.g. [1, 2, 3]. Memories from August 2007 seem to be returning. Recall the fact that Steve Ballmer and Bill Gates reportedly made calls to very high-level diplomats after it had emerged that the United States would object to OOXML. Microsoft’s last-minute lobbying endeavors turned out to be successful. “Steve Ballmer and Bill Gates reportedly made calls to very high-level diplomats after it had emerged that the United States would object to OOXML.”We later observed some very peculiar activities of this kind in Poland (with similar stories in Hungary) [1, 2, 3, 4, 5]. This is all very well documented, apart from a trail of phonecalls. High-level officials suddenly called for a second vote canceling the first one. The second one had Microsoft grossly over-represented. While in Greece’s case there is little more than just suspicion, the saga in Australia [1, 2, 3] simply continues. The article also incorrectly describes Rick Jelliffe as a ‘Microsoft developer’. While Mr Jelliffe consults widely to industry and government including Microsoft, he has never developed Microsoft products. Rick Jelliffe is not a ‘Microsoft developer’ as such. While Mr Jelliffe is being paid for consultancy work by Microsoft, he is not developing Microsoft products. How Many Companies Are Able to Implement OOXML? Zero. If you’ve ever subscribed to the Microsoft Developer Network, or MSDN as it’s commonly known, then you’ll find the OOXML “standard” document familiar. It’s a typical example of Microsoft MSDN-style technical documentation. It isn’t badly written; indeed for proprietary documentation it’s about as good as it gets, but as I’ve said before of Microsoft documentation, it’s fuzzy on the details. It’s not a standards document, something you can use to unambiguously create an implementation from scratch. A good example to use to compare it to real standards documents is to examine Internet Engineering Task Force (IETF) “Requests for Comments” (RFC’s) documents, which are publicly available on the Web. They use key words such as “MUST”, “REQUIRED”, “SHALL”, “SHOULD”, “MAY” and “OPTIONAL” and these words have real meaning in the standard, such that an implementor can be guided by these terms. The OOXML spec just doesn’t use the same precision in language that a real specification needs. It was almost certainly written by documentation professionals, not by engineers who actually understand the needs of the implementors of a standard. Already mentioned yesterday, the following new post from Bob Sutor refers to a new story and reminds us of the lessons to take from Microsoft’s failue to deliver OOXML support even in its own products. * Microsoft is not putting proper resources behind maintenance of Office 2004 for the Macintosh. * The software engineers working on Office 2004 for the Macintosh aren’t very good. * OOXML at 6000+ pages is just too hard a specification for expert software engineers working closely with the people who designed OOXML to be implemented easily and completely. Another one which was mentioned yesterday and he may have left out is the possibility that Microsoft feels as though it has done enough pretense work ahead of the BRM. Without ISO in its sight, Microsoft needn’t pretend to be nice (nor actually be nice) anymore. It’s an embrace-and-extend classic! It’s a standard routine (pun unintended). Some readers do not find it believable that Microsoft’s financial raves are merely an illusion that is largely propagated in the popular press and then reinforced using isolated voices with vested interest. The following new article gives a very detailed explanation of the reasons Microsoft bleeds money and has had its coffers gradually emptied over the course of the past few years. The End of A Great Illusion. The reality is that Microsoft is forced to falsify reports and color numbers because reality doesn’t support the illusion of Microsoft’s unquestionable market power. The company is failing in consumer electronics, and every year that passes makes its losses greater and its accomplishments less impressive. Consult any (or all) of the following posts, which contain an extensive list of supportive external resources from respectable publications. Might this be a question of timing? 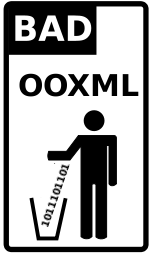 As you are hopefully aware by now, to Novell, OOXML is a matter of obeying a binding contract with Microsoft. Novell wanted to use bogus 'protection' (FUD) as an added value for competitive advantage and Microsoft’s terms and conditions for establishing such bogus protection included OOXML, which Microsoft needed Novell to support, thereby assisting Microsoft’s financial agenda. It was particularly curious to find that only a few days before the BRM in Geneva commences, Novell’s Public Relations team decide to post this rave which talks about OOXML support in Novell’s own 'special' edition of OpenOffice.org. You know they’ve been in the works, but the Office Open XML/OpenDocument format translators for presentations and spreadsheets are now available for download. The OpenOffice.org, Novell Edition binary versions are here, and the project source and upstream versions can be found here. The word processing translator, which provides the ability to open Office Open XML-formatted documents in OpenOffice.org, has been out since last March. Now users of the Novell Edition of OpenOffice.org 2.3 can open Powerpoint (.pptx) and Excel (.xlsx) documents in OpenOffice.org. It is probably a rhetorical question, but might Novell be using OOXML, which is a case against industry standards and GNU/Linux, as a tool for marketing itself, in pretty much the same way that it boasts patent ‘protection’ (which others neither have nor need) in order to market itself? Does it create and then introduces new problems that were never supposed to exist simply to promote its own selfish agenda, while essentially harming other GNU/Linux distributors and various Free software projects that cannot ever implement OOXML or buy ‘protection’, which was never needed in the first place? Well, Novell gained a few quarters of “coupon cash” from the deal (though my sources at Novell say that customers aren’t renewing their subscriptions at a rate that Novell would like), but I hope it recognizes the value in standing firm for openness. What little wind it got puffed into its sails from its interoperability lock-up with Microsoft just dissipated. That was a fine little good leak of inside information. Asay has former coworkers, whom he knows from his days at Novell. Previously he spoke about the staff exodus at Novell and about Novell cooking the books. When it comes to Novell’s dark secrets, this man is a gold mine.